Hi, it's Lee again from Freshly Pieced, back with another Fat Quarter Gang tutorial! It's the gifting time of year again, so how about this pretty, girly, simple-to-sew gift? 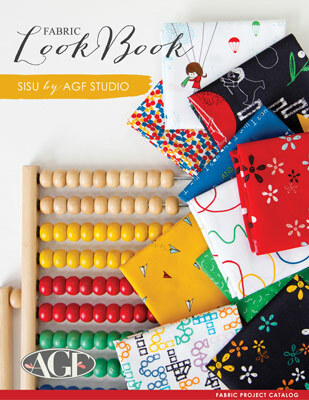 This sketchbook or notebook cover mimics the look of ribbon lacing and ties shut in a knot or a bow—perfect for friends, teachers, or anybody else on your holiday list! • 4 fat quarters from Art Gallery's Rock 'N Romance line. I'm using "Vinyl Charms Bianca" for the outer cover, "Stardust Dusk" for the "lacing" and ribbon tie, "Wild Hearted Spirit" for the inside flaps, and "Stardust Midnight" for the cover lining. 1. With the notebook closed, use a measuring tape to measure across the front cover from edge to binding, around the binding, and across the back cover from binding to edge. 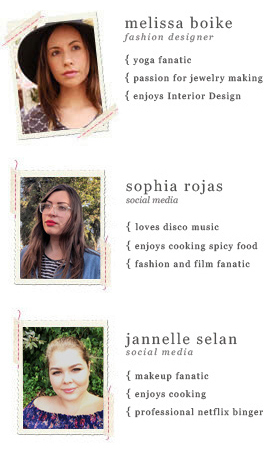 This is your width (mine was 16"). 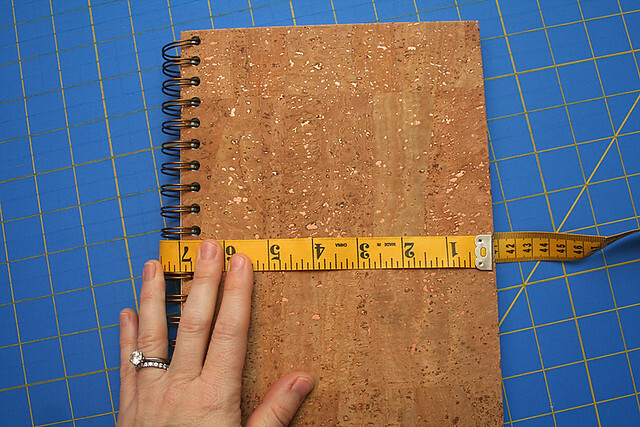 Measure the notebook from top edge to bottom edge to determine the height (mine was 10"). 2. Add 1 1/4" inch to each of these dimensions. So, the dimensions I'll be working with are 17 1/4" (width) x 11 1/4" (height). 3. From the "Stardust Dusk" print, cut pieces that are 2 1/2" x 1 1/2". 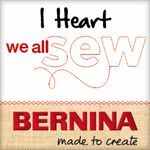 From the "Vinyl Charms" print, cut pieces that are 1" x 1 1/2". 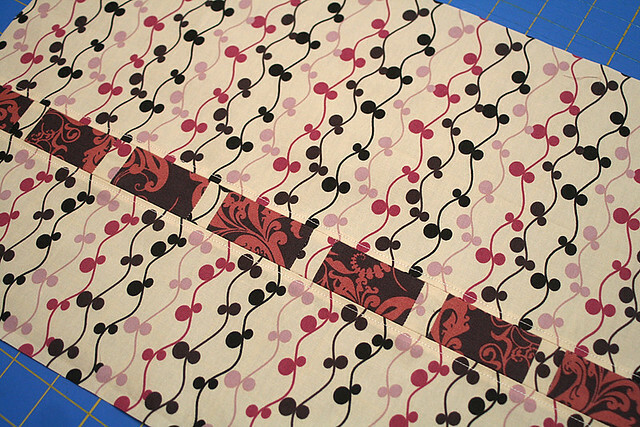 Sew these pieces together into one strip with a 1/4" seam allowance, alternating prints. 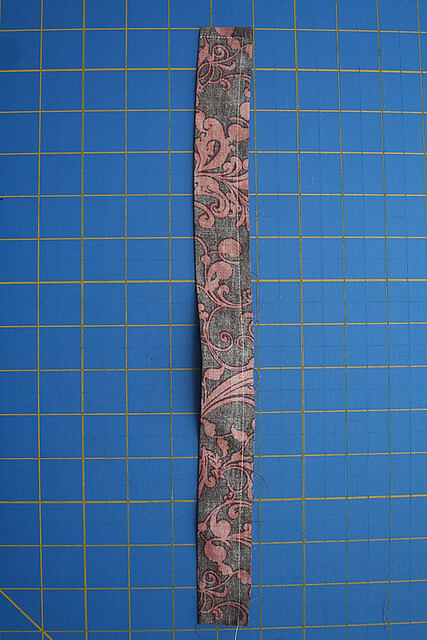 Sew enough pieces together so that the strip measures at least the same length as the width determined in step 2 above (17 1/4" in my example). 4. From the "Vinyl Charms" print, cut two pieces for the outer cover. These pieces should be the width determined in step 2 (so, 17 1/4" in my example), and the height of both pieces together should add up to the height determined in step 2. So my pieces are 7" x 17 1/4" and 4 1/4" x 17 1/4". The more uneven the heights of these two pieces, the more off-center your "lacing" will be on the finished cover. 5. 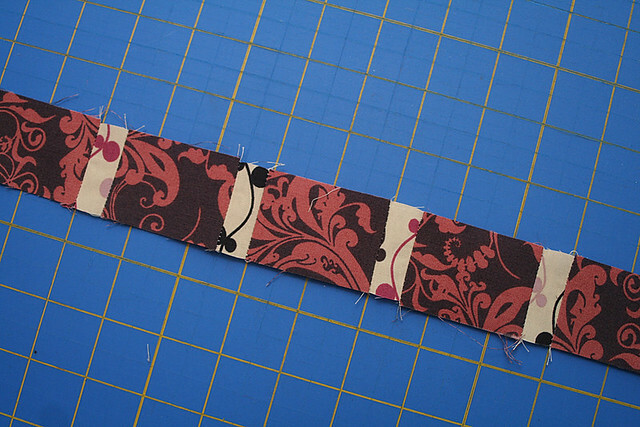 With a 1/4" seam allowance, sew the outer cover pieces onto each side of the pieced lacing strip. Trim the lacing strip so the ends are even with the edges of the outer cover pieces. 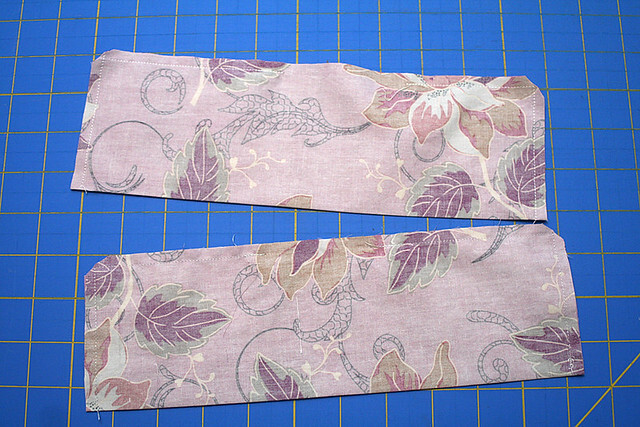 I added some decorative top-stitching 1/8" out from each of these seams. 6. Cut two strips 2 1/2" x 14" from the "Stardust Dusk" print. Fold the strips in half lengthwise with right sides together and press. Stitch down the long side of the strips, 1/4" from the raw edges, and across one short end. Using the pointy end of a chopstick, turn right side out and press. 7. Cut your cover lining using the dimensions determined above in Step 2 (so, my cover lining was 17 1/4" x 11 1/4"). 8. 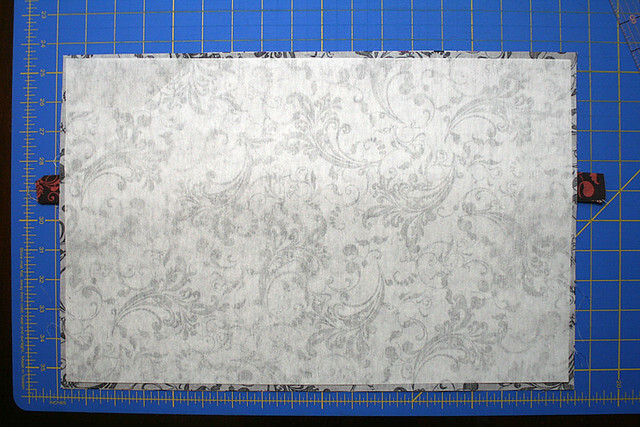 Cut a piece of interfacing that is about 1/2" smaller than the cover lining (so, my interfacing was 16 3/4" x 10 3/4"). Fuse the interfacing to the back of the cover lining, centering the interfacing on the cover lining so that there's 1/4" of non-interfaced fabric all the way around. 9. Pair up the outer cover piece and the cover lining piece, right sides facing. Place the "ribbon" pieces between the outer cover and the lining, positioned even with the pieced lacing strip on each side, with the raw unsewn ends sticking out about 1" on each side, as shown. 10. Pin and sew around the perimeter of the outer cover, leaving an opening along one side about 3" wide for turning. 11. Clip the seam allowances at the corners and turn the cover right-side-out, using the chopstick to poke out the corners. Press and set aside. There's no need to stitch up the gap for turning, this will be closed up in a future step. 12. Cut two pieces for the flaps that will hold the notebook cover. 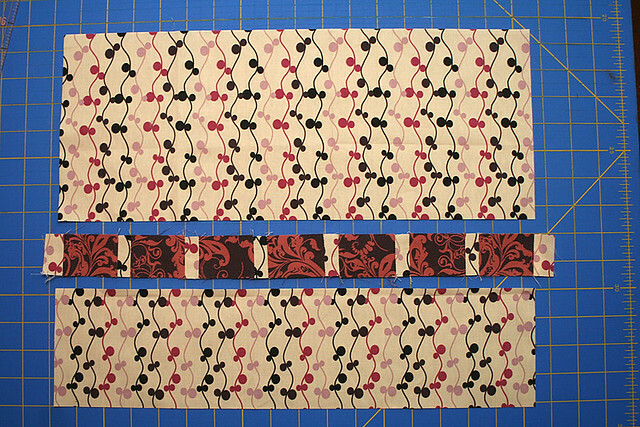 These pieces should be 8" or 9" wide and the height determined in Step 2" (so mine are 9" x 11 1/4"). 13. Fold the two flap pieces in half lengthwise, with right sides together, and press (so, when folded, mine measured 4 1/2" x 11 1/4"). Sew around all three sides, leaving a 3" gap for turning along the middle of the long side. Turn right side out and press. Top-stich along the folded edge, about 1/8" from the edge. There's no need to sew up the gap left for turning, this will be closed up in the next step. 14. Align flap pieces along the outer edges of the cover, with the top-stitched folded edge toward the inside of the cover, as shown. Pin around all three edges. Top-stitch around the entire perimeter of the cover, 1/8" from the edge of the cover. 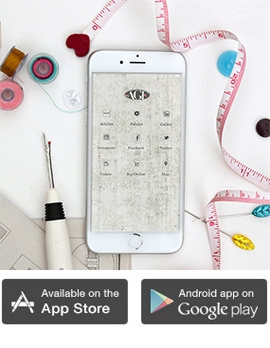 This top-stitching attaches the flaps and closes up all gaps for turning. 15. Slip the notebook covers under the flaps and tie the notebook shut with the ribbon bow. Enter to win your very own bundle of Rock n Romance by heading over for Freshly Pieced and leave her a comment to be entered to win. Giveaway open until December 21st.